Pharmacology is a broad and integrative discipline that focuses on the interaction of living cells with the regulatory molecules in their environment. It is a diverse science that proves basic mechanisms of molecular and cellular function with the knowledge that unraveling these mechanisms will lead to new therapeutic approaches to a variety of diseases. 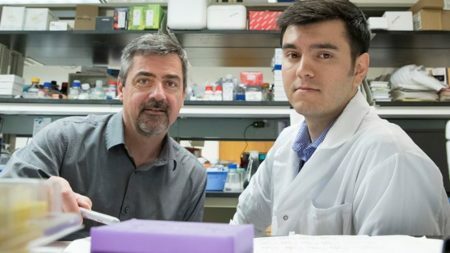 The Department of Pharmacology has a unique role within the basic biomedical sciences: to conduct investigations into the fundamental principles of cell function and translate these findings to clinical applications. Congratulations, Paula Barrett for Your Outstanding Contribution to Hypertension! The Pharmacology department would like to send out a huge congrats to Dr. Paula Barrett! The editors of Hypertension established a program to recognize High Impact Papers published in the Journal in the categories of basic, clinical, and population sciences. Dr. Barrett’s paper, Adrenal tissue-specific deletion of TASK channels causes aldosterone-driven Angiotensin II-independent hypertension, was selected as a High Impact Paper for Spring 2019 in the category of Basic science. 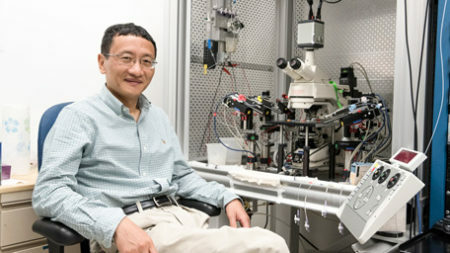 Dr. J. Julius Zhu has come up with a new technique that will let one cancer lab do the work of dozens. Congrats to Michael Schappe: Peach Award Winner! Congrats to Mike Schappe – 2019 Outstanding Grad Student!